Nothing is more welcoming than homemade soup. Why not make your own soup and have it as a main course. Soup for your dinner need not be from a can, heated in a microwave and eaten with a crust of bread. Instead find some recipes, or indeed devise your own, that are thick and tasty and full of vegetable and meat and eat it as a main course for your dinner. The ideal ingredients are left over meat from the night before, perhaps a few vegetables and whatever you have in your store cupboard. If you like spicy food try a spicy soup, if you like pasta throw some into the pot. Anything is possible. Take a look at the types of pulses and dried beans etc that are on the shelves in your supermarket. By building up a stock of these you will be able to vary your homemade soup every time you make it. Make sure that they are ready to use as some pulses need overnight soaking which rather spoils the spontaneity of making your own soup. If a recipe is successful write down the ingredients as you are likely to forget how it was made. A swirl of cream, single, double or sour – whatever you have to hand will make your homemade soup look very professional. Some cheeses also work well in main course soups. Think of Stilton and broccoli or cheese and onion. Make up your own main course recipes and surprise your family at dinner. Put a little oil into a deep pan and cook some chopped onion until it is clear. Add garlic, chopped carrots and a pint of stock made from a vegetable stock cube. Leave to simmer until all the vegetables are cooked through. At the same time simmer half a cup of red lentils in a little water and when tender add to the soup mix. Leave to cool off for half an hour. Put into a blender, although the hand held blitzers are better for soup and blitz it until the soup is thick and without lumps. Season to taste, warm through and serve. You may like your soup to be hot and spicy so at the stage before the stock is added put in half a teaspoon of curry powder or perhaps a pinch of chilli powder and mix well into the vegetables. 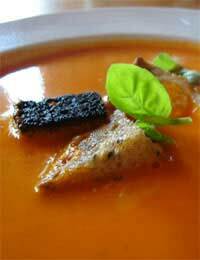 Try different flavourings - even unusual stock cubes in your soup. You can either use fresh meat such as chicken, turkey or lamb or leftover meat from last night’s roast dinner. Dice the meat and cook with the onions, leeks or any other vegetable that need softening in the oil. The meat can either be blitzed in the blender or a few spoonfuls taken out and added after blitzing to give your soup a lumpier texture. Cooked meat could be diced and added after the blitzing stage, but make sure it is cooked through properly. Although blending your soups will make them quite thick there are certain vegetables such as butternut squash or potato that will give a thicker consistency. Also if when you have made you soup you wish it to be thicker add a little instant potato powder to the soup to instantly thicken it.